Is there any provocation in which bombing schools and hospitals can be deemed a proportionate response by a civilized state? The above quote was just a stray comment (in response to media reports about the attack on a UN school in Gaza yesterday) by an acquaintance on Facebook, but it sums up exactly what happens when the media presumes the worse about Israel before the facts are in, ignoring counter evidence. The incident occurred yesterday when 15 Palestinian civilians were killed at a UN school in Beit Hanoun – an assault that both Hamas and Israel claim might well be the fault of the other. According to the IDF, there has been, for several days, continuous fire by Hamas from near the UN school (representing a violation of international law). However, before retaliating, the IDF attempted (over the course of three days) to facilitate the evacuation of all civilians per an official humanitarian window from 10:00 to 14:00 on Thursday – a temporary ceasefire which was evidently communicated to the UN and International Red Cross. Though it’s unclear why the UN didn’t facilitate the evacuation, additional statements by the IDF indicate that Hamas prevented Palestinians from evacuating the school. As far as the tank shells or rockets which may have hit the school on Thursday, resulting in the civilian casualties, we know that, according to official sources, IDF sensors detected ‘errant’ Hamas rockets falling at least in the neighborhood of the school. It is also is being reported that Hamas fired at the IDF from near the Beit Hanoun school and that “soldiers responded by targeting the source of the fire”, tank fire which may have hit the school or the area around the school. So, while we know that Hamas was once again using its illegal human shield strategy at the school in Beit Hanoun to shield its fighters, as of now, the UN still hasn’t determined whether Hamas rockets or IDF tank shells were ultimately to blame. 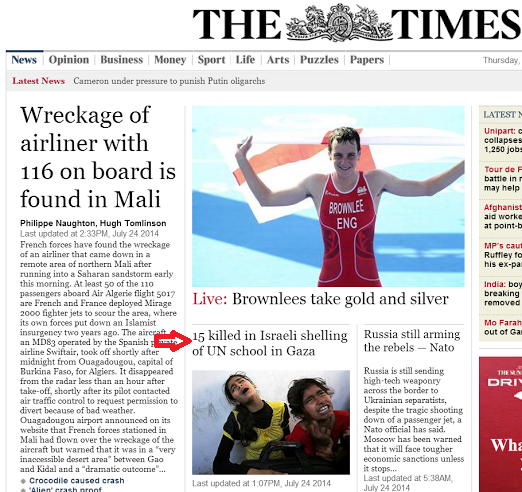 So, though while the sequence of events are unclear at this point, a day after the tragedy, this didn’t stop the UK media’s immediate rush to judgment – blaming Israel for the Palestinian deaths, and ignoring Hamas’s use of human shields. While some US media outlets were – quite tellingly – much more fair and circumspect in their initial assessments (avoiding headlines which blamed either side), the following headlines at the Guardian, Independent and Times (of London), published when very little information was known, indicate a troubling lack of restraint and objectivity. 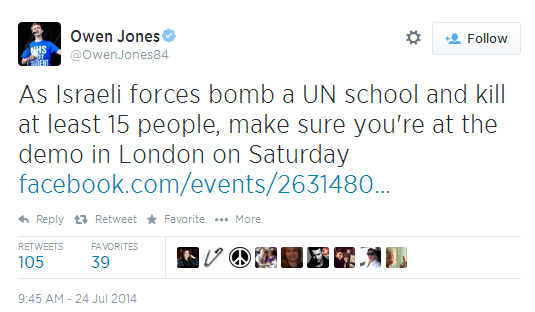 Indy, New Statesman and Guardian commentator Owen Jones Tweeted this, early in the morning on Thursday, before any facts were established (and even before major news sites reported the story), using the unproven allegation of an Israeli ‘atrocity’ to promote an anti-Israel event on Saturday. One last thing. 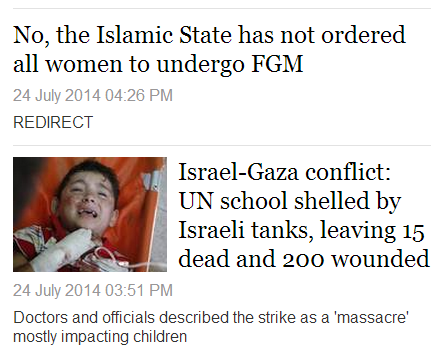 If you think that the media isn’t capable of employing restraint and avoiding the tempting rush to judgment, here’ are two stories featured side by side yesterday on the Indy’s Middle East page: one on the attack in Beit Hanoun and the other one focusing on reports that the Islamist extremist group ISIS (aka, The Islamic State) announced that women in the territory they control would be forced to undergo Female Genital Mutilation (FGM). It’s interesting that while the Indy was quick to defend the jihadist group from the ‘smear’ that they’re enforcing FGM, they showed no such concern for what may be another vicious libel against the Jewish state – one which, as we’ve seen, may have dangerous repercussions for Jews in the UK and across Europe. 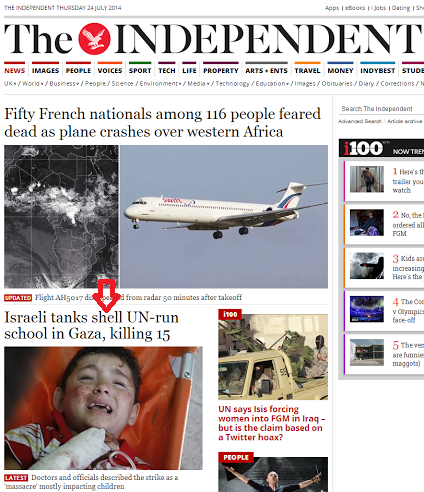 Reflexively accusing Israel: ah, the fair and balanced media. How admirable. What does seem to be becoming evident is that the fact that it was a Hamas own goal is becoming more and more possible and the closer it gets to proven fact the less attention will be paid to what started off by being another ‘massacre’. The newspapers that carry large advertisements featuring Qatar will be among the first to go this way. The BBC fell over itself to get out the story that not all terrorists or Muslims and also posted article after article about supposed islamaphobia incited attacks after the 7/7 bombings in London. Fast forward a few years and what is telling is just how silent the BBC in getting out to its viewing audience that not all Jews are responsible for the fighting in Gaza. In fact you could argue that through it’s shocking biased reporting the BBC is I fact inciting racial hatred against Jews for the actions of Israel in protecting its people. It is disgusting how deep the hatred of Israel goes in the BBC. The heroic fighters of the religion of peace just detonated the tomb of the prophet Jonah in Mosul. The Guardian and BBC report: “Israeli shells destroyed an antique Muslim shrine. When will be the application of ISIS for membership in the UNESCO will be accepted? It’s amazing that there are journalists who feel that second hand accounts to war can accurately describe a situation in 20-seconds while these same people scream CONSPIRACY when Israel comes back after 24 with evidence and proof as what actually happened. Hamas may very well have attacked that school with the double purpose of making Israel look bad and ridding themselves of so-called Traitors– those who are starting to not trust Hamas because, y’know, Hamas really only wants them dead. In this scenario, it’s Israel trying to save these children from the actions of terrorists who are trying to kill them. But this only works if the Western Media falls for it (like they have). Yes. Even backwoods, Jewish bashing fuckheads know Western Media is easily manipulated. A Hamas rocket hit the school and several more in the area. Yes, when the very authorities who are supposed to protect the integrity of civilian structures instead turn them into military assets, instruments through which to carry out war. Sorry to ruin your day, stray commenter. Do you people actually believe the rubbish you sprouting? Listen to yourselves… Gun fire from NEAR the school, could have been misguided rockets known to land in the vicinity! Get real. At least if you feel it justified to bomb people that have no escape, grow some balls and stand up and be counted! You’re still in victim mode: poor us, poor Israel, we always get blamed for everything…keep telling yourselves that you are the most careful killers of them all… Anything not to relinquish the pathetic victim status and to keep your conscience asleep! Are you American? British? from a NATO member country? how can you sleep at night? You (yes you) are responsible for killing a lot more people. OK , Banned from commenting in the Guardian , after 10 years. It has become like commenting at stromfront. I don’t know which is worse the vile antisemitism in BTL or ATL . Today Harriet Sherwoow is explaining why its legitimate for Hamas to fight among civilians. That paper just has no shame. Glad to see the back of you! …I wish. Only I know you’ll be back under another assumed name. Really, though, sounds like you could do with a holiday from reading the Guardian. It just makes you very cross! !